Haney Automotive is Ridge-Meadows #1 rated Automotive Repair & Maintenance Shop. We have owned Haney Automotive for 14 years and from the very beginning have always looked to build relationships with our customers. It's about getting to know people and their vehicles and establishing a real trust. We are a family run show with myself, Brandon Zimmerman and my wife, Heather McRitchie at the helm. There is a great pride in being a business owner here in Maple Ridge. We love this community and basically we just love fixing cars! . 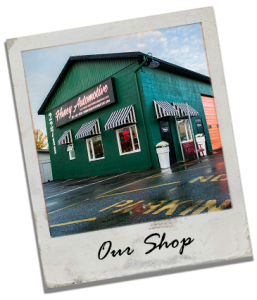 In 2016 The Maple Ridge Downtown Business Improvement Association approved Haney Automotive for upgrades to our building under their fantastic Business Façade Upgrade Program. New Paint, Windows and Awnings have proved to be welcome additions and spruced us up. In 2017 we finished off the inside of the office as well with some new décor and organization. When you look good. You feel good! Maple Ridge’s own, Nathan Leatherdale has joined the team at Haney Automotive and will be starting his Apprentice Program in September. We expect great things from Nathan. He is a smart and hard working kid and will be learning not only from a wonderful program at The University of Fraser Valley but also from our amazing technicians here at The Shop. Our All Stars , Chris Duff & John Duncan.